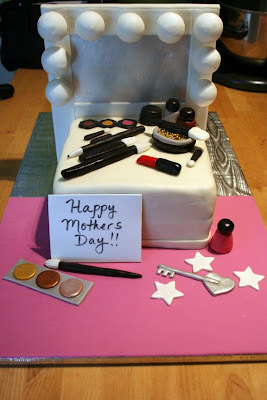 This cake was ordered from a good customer of ours in celebration of Mother's Day at her church. The "mirror" is a piece of foam board with fondant accents (luster dust to give it the mirror look). The light bulbs are styrofoam balls covered in fondant fastened to the the board with t-pins. 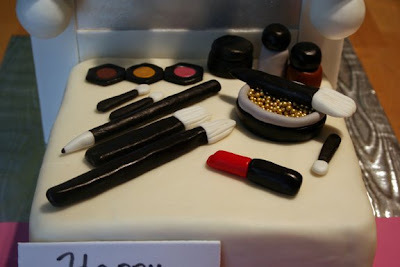 The makeup pieces are all fondant. There are gold dragees in the makeup bowl and the eyeshadows are painted with lusters dusts as well. The cake is marble and is covered in mmf (vanilla bc underneath). Rodney totally took the lead on this cake. He made all of the makeup pieces, which came out beautifully. I did all of the creative painting and artistry but his natural talent for molding and modeling really shone through on this cake. We had four pretty big cakes this week and if it weren't for him and the great job he did, it would have never gotten done! Really pleased with this one!